I'm a delinquent snarky sister this week. I have been sick sick sick. Shout out to SISTER CHRIS for managing things on the SoSS BLOG while I have been napping the days away. Valentine's Day is approaching, Edna and the sisterhood want you to pucker up and show us your best kiss. It may be snarky, it may not, either way we wanna see it. I made this card sometime between 2:30 and 7:00 am yesterday, under heavy influence of cold meds. I don't even remember adding the sequins, but WOW my craft room is really tidy...apparently when I am delusional I like to clean...who knew?? Be sure to visit the SoSS BLOG for all the details on the challenge. 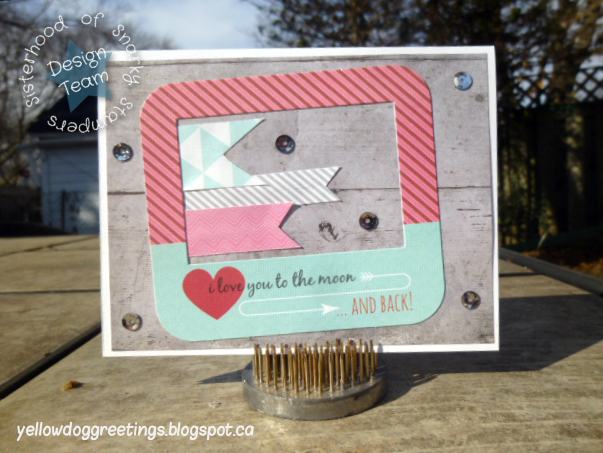 While you are there please show the sisters and our guest designer some crafty love! As always, we'd love for you to play along with us!! Great card, and too funny cleaning while delusional. Feel better. See? I TOLD you the real genius surfaces when under the influence of drugs! LOL! (Joking....sort of....wink) Your card looks awesome!! Looks really good for someone hopped up on cold meds, I wouldn't be able to glue anything straight. funny how you don't remember the sequins fab job with them. Great card, can't believe you made it when you were feeling so rough - hope you are feeling better now. And next time you're feeling delusional, would you like to come and tidy up after me?